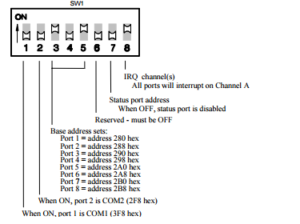 kdb356: Echo/ISA on Windows 7 - Connect Tech Inc. There are multiple configurations that can be adjusted to the user’s needs. For this demonstration, we will use the following from the Windows NT setup in the Echo/ISA manual. In this setup, the Base address for port 1 is addressed to 0x280 and each additional port is incremented by 0x008 (e.g. port 2 is on 0x288). Additionally, IRQ will be set to Channel A. For this configuration IRQ will be set to 10. When in the BIOS (where possible): Proceed to the PNP/PCI configuration and set the resource control to manual. Select IRQ Resources and set the IRQ 10 to reserved. Proceed now to the Memory resources and set Reserved Memory Length to 64K and Reserved Memory Base to D000. If your BIOS does not have these attributes please inform support@connecttech.com and we can assess compatibility of the Echo/ISA device(s) with your system. You should now have I/O Range as ? and IRQ as ? When restarted you will find your ECHO/ISA Port 1 configured. You must repeat the windows setup for each port.